If you run a blog that accepts comments, you may know about the thousands of comment spammers that arrive monthly… that make you want to dump your blog all together. 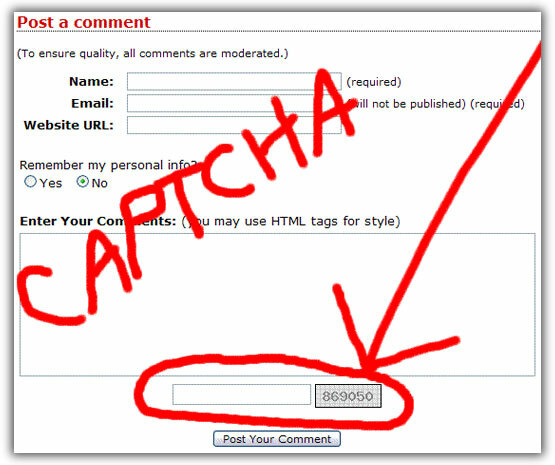 Not wanting to be held hostage by our own blog and realizing the importance of allowing comments so that a true ‘market discussion’ can take place, our programming crew recently implemented a CAPTCHA system designed to attempt to eliminate the large majority of bot comment spam posts. In addition to the CAPTCHA added to the blog comment process, we’re also nearing ready to release a change to the entire EzineArticles.com site that would eliminate the clumsy “registered commentor” system for commenting on articles and would replace it with a CAPTCHA for human identification. What is a CAPTCHA you ask? A CAPTCHA (an acronym for “completely automated public Turing test to tell computers and humans apart”, trademarked by Carnegie Mellon University) is a type of challenge-response test used in computing to determine whether or not the user is human. Indeed, I could not agree more with your opening statement. So if this is a solution it is a good one. Another quality innovation. I’ve heard it said that successful entrepreneurs continuously try and come up with new improvements. This one’s a keeper! Please keep us posted on how well it works.